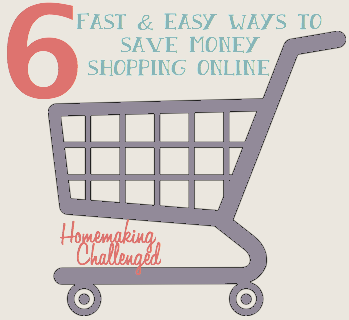 Six Fast and Easy Ways to Save Money when Shopping Online. I am a HUGE fan of online shopping. It helps me with my busy schedule to get things done. I also love saving money! Here are my favorite tools that I use to save when I shop online. If you have not already heard, about the great thing called Amazon Prime. Please allow me to educate you. It is amazing! Here are the highlighted benefits. I did all online shopping for my kids this year. Ordering with free 2 day shipping means that I got my gifts quickly, and was easily able to take advantage of the deals and not have to add in pricing. It ALSO provides free streaming of movies. It has a great selection, some of it crosses over with Netflix (which we have and love), but Amazon has Nickelodeon shows, and more BBC options, and we LOVE Doctor Who. It is also CHEAPER than Netflix for one year, and has a rental option for those who are cheap, and don't do cable. If you are a mom who has kids in diapers, than you may want to look into Amazon Mom, while it doesn't include the streaming or other freebies, it does offer you great prices (20% off!) on things you use all the time, without having to leave your home with kids in tow. Our family has easily covered and more than the Amazon Prime's $79 membership cost, and save tons of money and time this year! A free program where you get a percentage of cash back for shopping online! Did I mention it is FREE!!! All you do is signup for free, and then shop from the ebates link provided. You still qualify for any other discounts the site is offering and then each quarter you get either a check or money into your PayPal account. Here is the other GREAT thing, you can still use discount codes, or anything else a regular shopper would! For example, if you knew you were going to make a BIG purchase at a place like Home Depot, you could easily buy it through ebates, and then select the "pick up in store" option. You get an extra percentage back in cash (currently it is 3%), plus if you use a rewards credit card, you can usually get an additional 1-5% back. Which will significantly drop your overall cost. LOVE IT! It also provides great coupon codes for you to use for additional savings! If you haven't used this before, you are missing out! It has a fabulous site with great coupons, and also has a great mobile app for in stores. I always check this site before ordering on line. It is such a fast and easy way to save money! This site gives you some great codes for free shipping that you can use to get your goods to you for free! Sometimes it even has extra coupon codes as well! There are lots of these sites, the ones that i have used personally are Joss & Main for home goods and Zulilly for kids/home. It is FREE to sign up/join. They are great because you can get brand name items for half the cost! 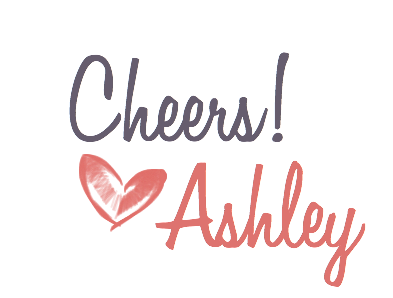 They each have "events" which only last a set amount of time and they only have selected products, but if you are patient and wait you can find KILLER deals on great products that rarely go on sale anywhere else. As the consumer you have the power! Plan ahead, spend a few minutes to google a coupon code, or wait for sales and you can save your family tons of money. I don't know about you, but I love saving money, the more the better! The best way for you to save money online shopping is by being smart, spending a few minutes going through these tips, or even better discover your own! What tips do you use when shopping online? How have you saved money? This post contains affiliate links. I appreciate your support by signing up or purchasing through them. Thanks so much! 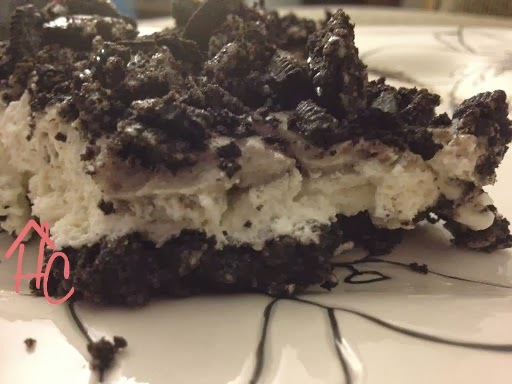 After I made Cherry Junk for my Dad's birthday last summer, my hubby and I were talking about other no bake desserts we could make for game night. He was not a fan of Cherry Junk, mostly because he is not a fruity dessert person. I jokingly told him he would only like it if it was covered in oreos. 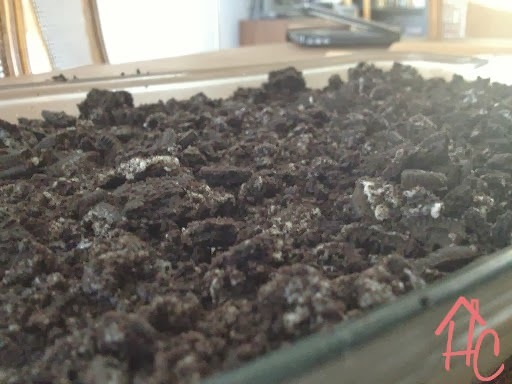 That lead to the creation of Oreo Junk, a new family favorite! This recipe is so easy! First thing you need to do is to make the crust. 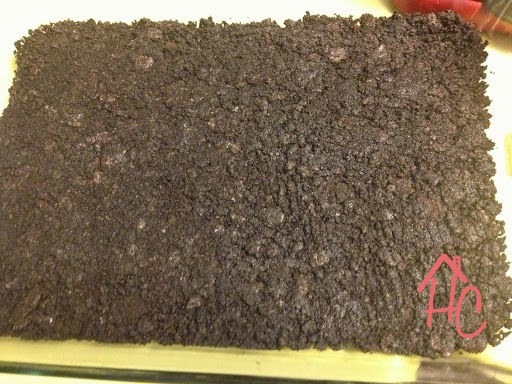 Toss 1 1/2 - 2 sleeves of Oreos into the blender, and grind them up. 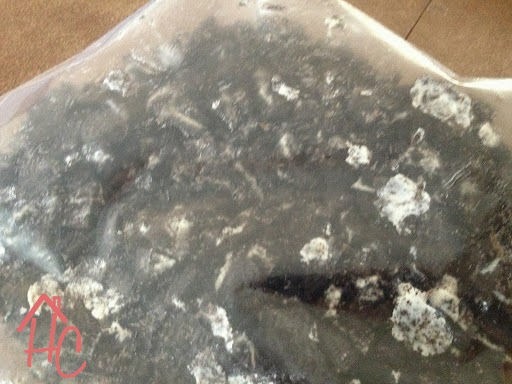 Melt a stick of butter, mix the Oreo grounds, and press into the bottom of a 9x13 pan. Now mix up 2 packages of Dream Whip according to the box. 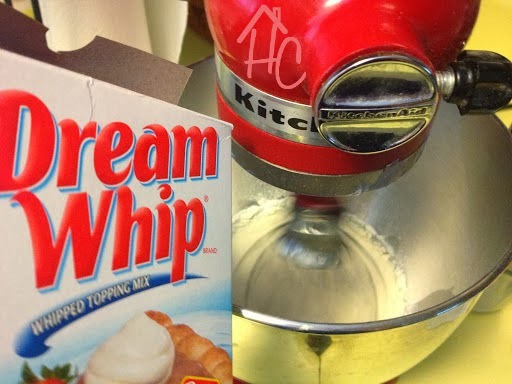 Now add 14oz of softened cream cheese to the Dream Whip and mix. I usually toss a kitchen towel over my mixer so it doesn't get everywhere. 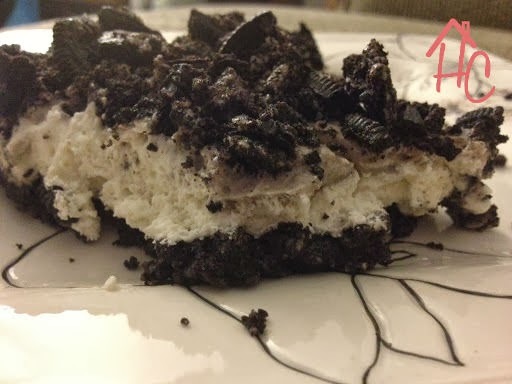 Now pour the Dream Whip/ cream cheese mixture over your Oreo crust, it should be somewhat thick. 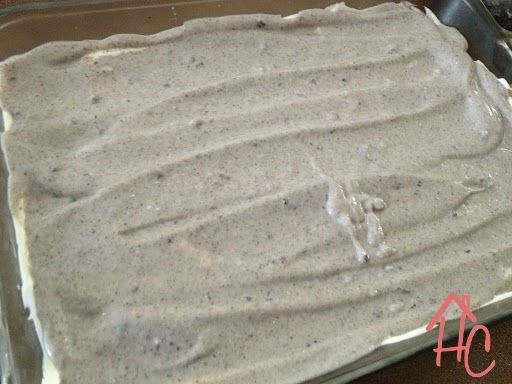 Spread evenly over the whole pan. 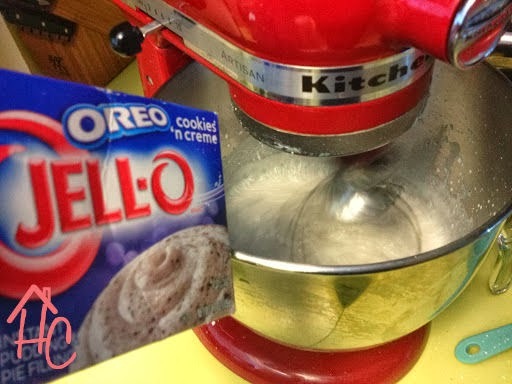 Now take a package of Jello Oreo pudding and mix according to package directions. 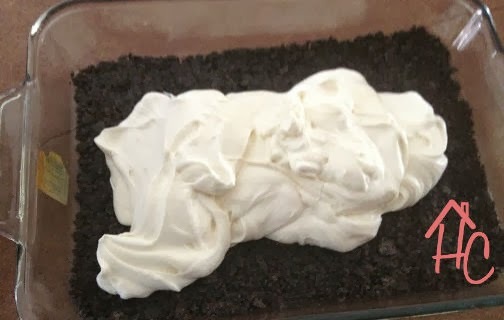 Then evenly spread it on top, don't worry if it isn't perfect, it is called "junk" for a reason, and the extra Oreo's will cover up any unevenness. Then spread them out on the top. Stick it in the fridge for a few hours (best over night), and dig in! 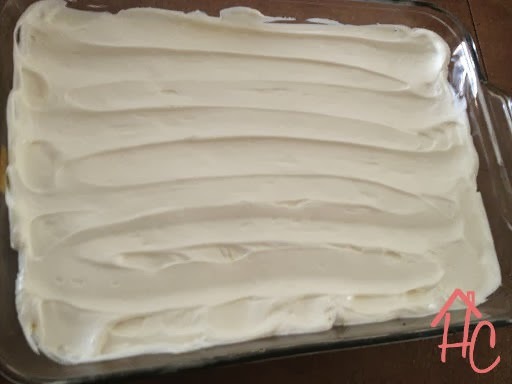 This is an amazing, no bake dessert! I hope you enjoy it as much as my family! I discovered a GREAT new meal planning tool that I have been using for a few weeks now. I LOVE IT! 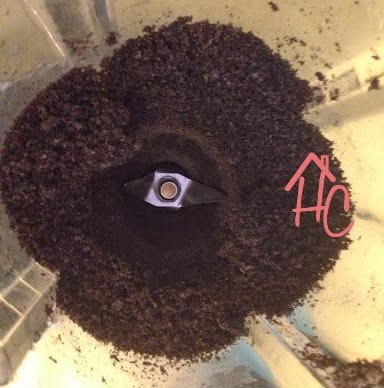 I honestly was leery about it, but it makes my life SO easy! If you have not signed up for Plan to Eat, DO IT! It makes things so easy, you can use any recipe you enter/find online, you get a custom shopping list, and can view your meals in week, or month. Also, the cooking view for while your cooking is AMAZING. You can even get a free trail for 30 days. I know that you will love it as much as me! If you have been around here much, you will notice that all of these are NEW recipes! It is thanks to Plan to Eat, it made me get out there and look for some new stuff, and it was so easy to get the ingredients for! If I find stuff that has ingredients I normally don't buy, I usually skip it, but this has made it easy. 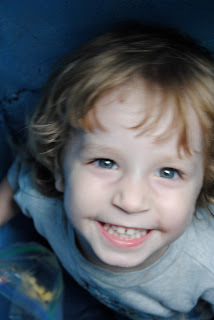 As always, I'm linking up with OrgJunkie! Hope that you enjoy your week! Have you ever had a day that starts bad and gets worse? When by 9am you are already bracing yourself for the next bad thing to happen, you know it is bad. My kids have turned into tantruming monsters in the morning because they REFUSE to sleep past 6am. Anything I try to do to get the house in order before work in the mornings causes hysteria because I am not holding/cuddling/catering to the every whim of my 3 year old or almost 18 month old. Discovering that you left two gallons of milk (from costco) out over night, because the kids wouldn't cooperate and let you put the groceries away. Finding that the "fun holiday" creamer flavor you thought you would try is actually horrible and completely ruined your coffee, but you are in desperate need of caffeine so you drink it anyways. Having two children pound on the door and scream the entire time you are doing laundry so that everyone has clean clothes to wear. 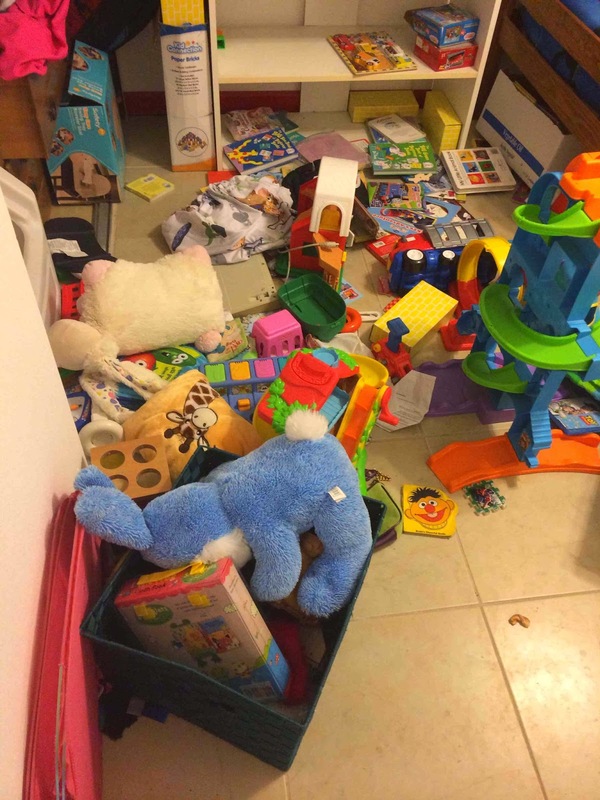 Your 17 month old have three meltdowns after saying no to everything you offer her. Only for her eventually eat what you put in front of her in the first place. Got a notification that our checking account was in the negative, because I forgot to transfer funds, and we had 3 things that I didn't know about come out all at the same time. All of this happened before 7am this morning. My wonderful husband got up to help me handle it. When I was sitting on the couch taking a "mommy time out" my sweet three year old said, "mommy I love you" from the breakfast table. Even when he is pushing all of my buttons, he seems to know when I have had it and attempts manages to melt my heart. I successfully put away the kids laundry, and everyone left for work/daycare fairly unscathed, clothed in weather appropriate attire. My husband took the kids to daycare so I got 15 minutes of a completely silent home to pray, and recompose myself after the hectic morning. I was able to get ready and out of the door and to work on time. We have so many blessings that we tend to forget when our day gets started off on the wrong foot. Two sweet amazing kids, who even though some mornings they drive me crazy. An amazing husband who supports me as much as he can. A great home, a great job, and wonderful people in our lives. I am thankful for this season of Advent when we can take time to focus on the coming of Jesus. This has been my life the last two weeks (today was just a small example). My son got sick, I got sick, we had thanksgiving. Life keeps moving. Hope that you all have faired better than us. It seems to start earlier each and every year. The Christmas songs, the store ads, the Black Friday opening hours and the decorations seem to appear the moment Halloween is over. Sure it is the phrase you have heard over and over, but there is a reason for that. It's TRUE. Your focus should be on celebrating the greatest present ever to mankind. Christ's birth is the reason we have Christmas. Do things that highlight the point of Christmas! Come up with a list of things that you want to do. Activities, parties, celebrations etc. Create a list and then make a plan as to when these things are going to happen. Know what you need to say "no" to, and know what you can say yes to. Make sure you leave some open space for some down time! For me, the Christmas season starts after Thanksgiving. For years I have been the crazy person with a baby, racing for a great priced item, trying to cross everything off my Christmas list at once. Honestly, it starts you off on the wrong foot. I love a deal as much as the next girl, don't get me wrong, but with using coupons, and shopping after Christmas sales last year my kids gifts for the most part are already purchased. Sure I will be doing some online shopping to fill it out a bit, but we don't need more STUFF. Trying to get some great deals is fun, and an adrenaline rush but it is also stressful. Instead, we are blessed with the internet, and you can do most of your shopping from the comfort of your own home, and leave the crowds and chaos behind. Honestly celebrate. Embrace the fun, the party like atmosphere. God sent us an amazing gift, each year we spend time celebrating, but we don't seem to actually celebrate. We rush around, give/get gifts. Embrace the JOY of the season and truly celebrate the birth of our Savior. These are just a few tips. There will be more later. My amazing Mother-in-law gave my son an AMAZING 3rd Birthday present. She sent us to Disneyland for two days with some spending money. I've always been a Disney girl at heart, but even though I didn't get to go on any of my top rides, it was one of my favorite trips ever! If you follow me on instagram, you got to see some of these pictures, but let me tell you, the sheer joy on my sons face the ENTIRE time practically had me in happy tears the whole time. He loved every minute of it. Here are some of the pictures. Both kids wore their Mickey ears on and off during the trip. It made me smile to watch them be a part of Disneyland, and all of the history of it. Yes, I know I'm a Disney nerd. We started with a Chip & Dale's Critter Breakfast at the Grand Californian Hotel and Spa. Max The Birthday Boy LOVED every second of it. His sister... not so much (so no pictures of her were taken with characters, for the most part). We all enjoyed King Author's Carousel, and baby girl said "weeeeee" the whole time. Absolutely adorable. Baby girl also decided to scream and throw a fit every time we had to get off a ride. Apparently, she liked them THAT MUCH! ... THE WHOLE TIME!!! I was in mama heaven watching him have so much fun and being so excited about everything. Poor baby girl passed out while waiting to meet Mickey, but I got some pretty sweet cuddles, so I was ok with it. We had an amazing time! It was such a wonderful blessing to us as a family. We were also blessed to have Matt's wonderful sister with us to help us wrangle and spoil the kids. Baby girl got to meet Minnie Mouse, and DIDN'T CRY! Though she wouldn't go up to her by herself either. Overall, it was a GREAT family trip! We didn't get to take a vacation this summer, or even just a weekend away with just the four of us, so this was such a nice break together. We LOVED every minute of it, except having to say goodbye. Hopefully we will be back sooner than later. 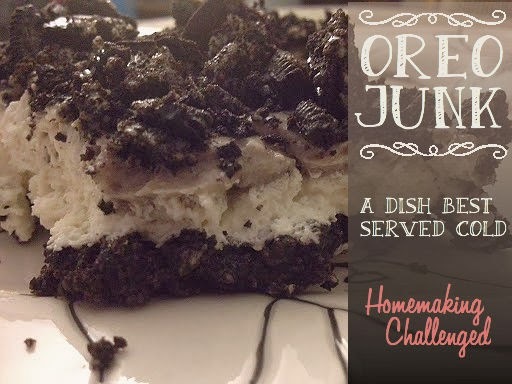 Ps I'm linking up with the OrgJunkie! If you are stoping by from there, please say Hi! I can not believe how true those words ring in my ears. You are indeed a Big Boy now. You have had an amazing year! You started the year in diapers, but soon upgraded to big boy undies. You moved into a big boy bed. You started having actual conversations with people, and now you barely stop talking! You discovered your love for outdoors, parks and playing. You love books, superhero's and building. You discovered your love for movies especially with mommy cuddles. You are coming into your own, and sometimes it a bit too hard for this momma to handle. You have the best laugh in the entire world! Your smile melts my heart. You are stubborn just like your momma, and have a hard time accepting things you don't want to do. You love to play and tease and run and hide. Your gusto for life never ceases to amazing me. You greet each morning with so much joy. Even though, most of the time I wish you would let me wake up and have my coffee first, or sleep in just a little longer, I love your passion for life. You started Awana this year and LOVE it. You are always excited to go to church to see your teachers. I pray your love for Church and seeking God will only grow as you get bigger. Happy 3rd Birthday to my sweet little man! I was surprised for a number of reasons, but when I think about it I shouldn't have been. It is the answer that I started with. It has been staring me in the face this whole time, and I didn't realize it. I have been bombarded, both in person (by people who I know in real life), via email, facebook and other means of communication about how much people appreciated/identified with my Finding Balance post. You see, I knew it when I named my blog. I was honest, and it was the most honest title I could choose. Homemaking Challenged. I started out originally (see my very first post here) to give myself an additional motivation, to track my journey in becoming a true homemaker. I poured over fabulous blogs, hoped onto pinterest in the early days, and always fell short. Way short. I was determined that if I had a blog, and tracked my journey it would force me to become a better homemaker. 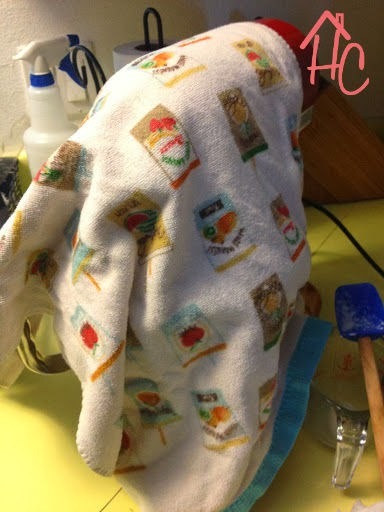 I attempted to laugh over my "failures" as a homemaker on the blog. I attempted to not be discouraged when going over to others homes and seeing their beautiful space. Honestly, I felt alone. I mean the "messy" shots on some of my favorite blogs, were no where near my reality. I obviously have way to much work to do on me and my home to even compare. After going through my 31 day series and the feedback from people with my final post, I realized what I was doing wrong. People want real. They don't just want to see the "pinterest worthy" project, but the hard stuff too. They want to know that they aren't the only ones struggling, they want to know that they aren't the only ones who's bedroom is a disaster zone so that they can have company over in the living room. I am going to strive to have more balance on my blog, and be more transparent with even the ugly stuff. I want you to know that you aren't alone. My point is, the answer has been staring me in the face. I am a work in progress, I am Homemaking Challenged, but so are many others. I am not alone in this journey and neither are you. We are all people in progress at different places in our own unique journey. We can not compare, we should not judge, we can encourage and inspire. I hope that is what this blog will do. Encourage and inspire others to join the journey and become less Homemaking Challenged.